This golf-themed sand garden features low-maintenance reindeer moss and air plants. 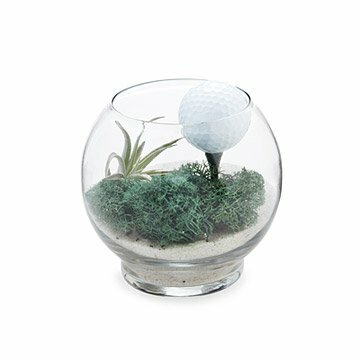 If golf is your world, and life is just the time that passes between holes, then Liza Fiorentinos' desktop terrarium is the oasis you need to get yourself through the rest of the week. The miniature scene presents nature as it should be—a picturesque backdrop for a golf ball, ready to tee off—and living reindeer moss and air plants offer a breath of fresh air with almost no maintenance. Hand assembled in Astoria, New York. Click here for Set Up and Care Instructions. After 15 years in Paris, Liza Fiorentinos was ready to come home to New York City, but she couldn't get the innovative vertical gardens she saw in the City of Lights out of her mind. Inspired by the calming effect natural elements have in manmade environments, her living art is brings nature indoors and counteracts the draining effects of fluorescent lights. "Plants are great feng shui!" she says. "They boost your mood, help you focus, detoxify the air, and bring a smile to everyone's face." Mist plant with water weekly. the tee and golf ball seemed too big for the glass container. would have been cuter if the glass container was bigger with more sand.